Winner of the 2007 BookBrowse Ruby Award. How I Found Out About It: Who doesn’t know about it? I feel like I was one of the last readers to hop onto the bandwagon for this book. As long as I have been into the YA genre, bloggers have constantly been raving and recommending this book to others. Although I enjoy reading about World War II, the long length intimidated me for the longest time so I kept on procrastinating to read it. When I finally gave in and decided to give The Book Thief a read, I was amazingly astonished. Even though it took me longer to read this book over several others because of the slow pacing and length, it was worth every second. For those of you who don’t know what the story is about, it follows a young girl named Liesel through the eyes of Death itself during World War II. When she learns to read, she starts stealing books and sharing them with her supportive neighbours, including a Jewish boy who hides in her family’s basement. To escape the woes of the war, Liesel reads all the time, but will it eventually get to be too much? Will she have to sacrifice her life because she reads books rather than paying attention to reality? I found Liesel to be adorably innocent, and I guess that is both good and bad. It was good because we got more of a focus on her love of reading than on the terrible war, but bad because she was ignoring reality for the most part and blocking it all out with books. Nevertheless, I adored her passion for reading and I thought she was a very kind character. I as well definitely appreciated the aspect of family we oversee in this story. Much like Anne Frank hid in an annex during World War II, the Meminger family hid a boy named Max down in their basement. They interacted with him with a welcoming mindset and that was one thing I loved about this novel. Hiding Max came with some fatal risks, and I’m glad that Liesel’s family was supportive and didn’t care if they were shamed for doing what should have been considered as a good deed. My least favourite part of this book was most likely the incredibly slow pacing of the plot. Hence the mere 550 pages of the story, it takes a very long time to progress and I sometimes got bored during the slower parts. If I were to push that completely aside, though, then I loved virtually every other aspect of this book, which includes the interesting POV of death. 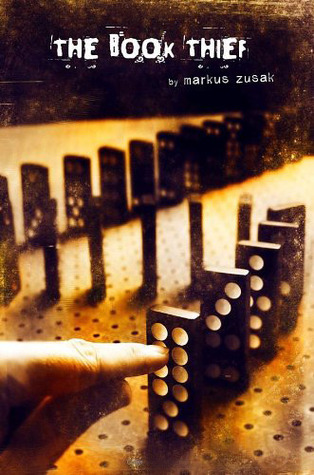 Having read and adored this novel, I will not hesitate to read more from Markus Zusak. His writing style and imagination are both amazing and although we all know how horrible the concept of war is, Zusak captures it in a way that all teens will comprehend and value. If you have not yet gotten around to picking up The Book Thief then you should do so now- before I steal all of your other books and replace them with this one! I’m so glad you liked this- I loved this book! I loved what you said about Zusak’s portrayal of war. Great review!